The Detroit Auto Show claims 5,000 journalists from all around the world will attend the press days starting tomorrow. How does one divine consensus from so many fickle-minded opinion leaders? How about this: our newly-patented Journalist Opinion Barometer! 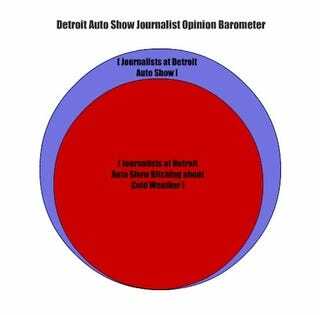 Throughout the show, we'll attempt to provide context for those of you clamoring for what's really going on in the minds of the myriad of muckrakers, pundits and powertrain experts in attendance at the 2010 Detroit Auto Show. Just look for our re-occurring opinion barometer throughout the show — it'll tell you exactly what the journalists here are thinking. Like today, for example. They think it's cold. And yes, it is cold — just like 70% of the rest of the country today! See, it works! Brilliant!